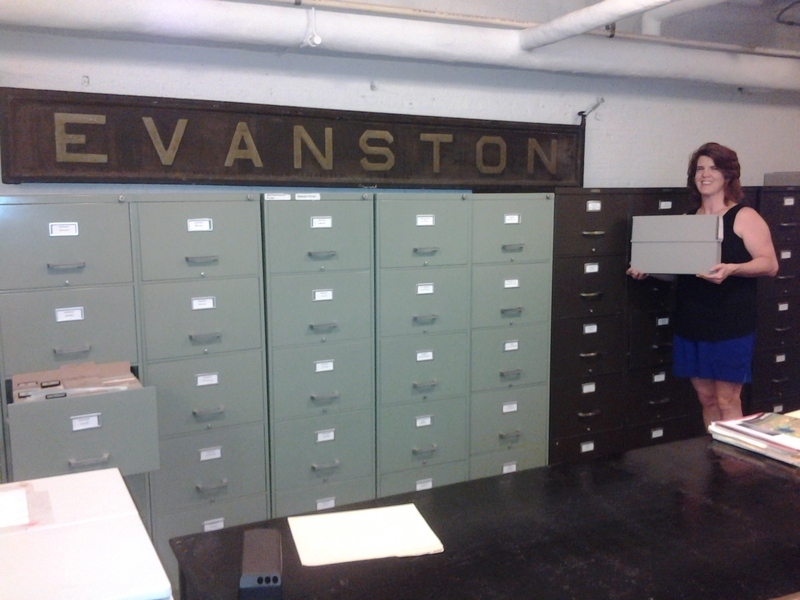 Here I am holding The Community Kitchen archive files in the research room in the basement of the Evanston History Center. It was a delicious treat to sort through the files related to The Community Kitchen while I was at The Evanston History Center in July. I touched the same scrapbook my great-grandmother assembled, which showcased the numerous articles written by magazines and newspapers. It was so delicate, frayed bits of newspaper crumbling in my hands — little bits of weathered, yellow-with-time paper created a flurry of history snowflakes. It was a very delicate process indeed. I exaggerate. It was not that bad, but the original newspaper articles from almost 100 years ago were quite delicate. The scrapbook that my great-grandmother pasted in the articles cost $.10. As I looked through the scrapbook, I thought of my great-grandmother pasting them in, with a proud gallant heart. I could only imagine she giggled with delight (although I doubt my great-grandmother giggled). I took a research class in graduate school (East Carolina University). I admit, at the time of the class, archival research seemed dry and a bit boring. I now think research and archives are the most fascinating thing. I love putting on the white gloves (you must wear white gloves when touching archive photos) and taking jaunts through back in time. jaunt: (n.) a short excursion or journey for pleasure. I do not believe my research to be jaunts; they start that way. Then they turn into voyages, traveling across continents, decades and even centuries. History is a wonderful thing. I just wish I lived closer to Evanston as I have only uncovered the tip of the iceberg. If I lived closer to Evanston, I would be in the research room every chance I could. The Evanston History Center is quite beautiful. The Evanston History Center. This house is even more exquisite inside. And I promise to post more photos soon. But if you would wish to get your how-the-aristocrats-in-America-lived fix, see this post on my Community Kitchen Tumblr site. I do post more time period photos and tidbits regularly there. 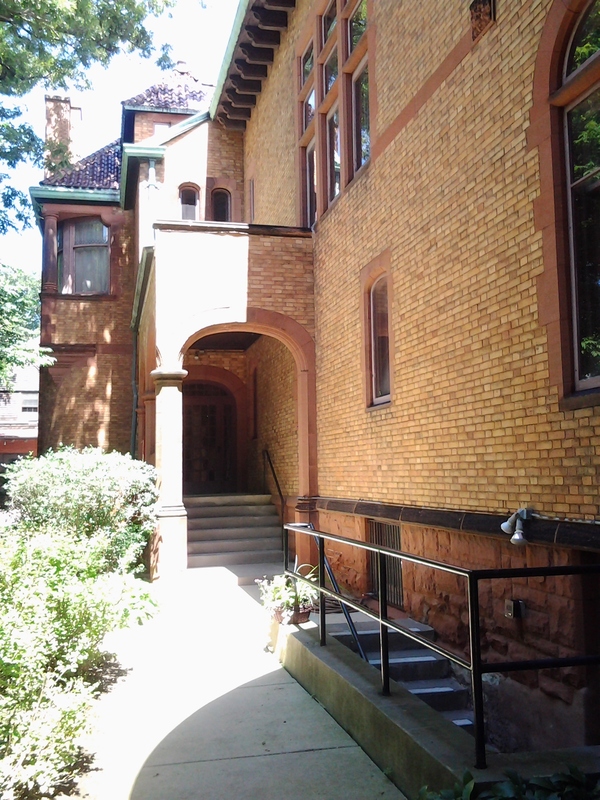 So, if you look at this photo and are not local to Evanston or the area, go to the left, dare not to step on the manicured lawn, and walk down (skip if you delight as I often felt like skipping while I was there) the sidewalk on the left and you will see a staircase. This staircase will lead you down into the research room, which is in the basement. OK. I can see you would like a photo. This is the entrance to the research room at the Evanston History Center. Speaking of icebergs, who is watching Downton Abbey. Oh my! I am so excited about that show. I watched part of an episode with my brother-in-law (he is a history enthusiast), in the middle of season three and thought, “Oh how dreary and dry.” Then I gave it a second chance and watched it from the beginning. Well, I am on Season 3 and have been longing to watch it every waking minute (when I am not working on the Community Kitchen project or spending time with my family). Even so, how delightful a series. And I admit, I long to watch it even when I am working on the CK project and spending time with my family. I am completely addicted. Soon, I will be caught up to the end of Season 3, and will wait like a proper lady for the start of Season 4 in January 2014. Guess who made Charlotte Russe? Well, of course you know Ethel made it for the girls at the luncheon at Isobel Crawley’s home (I will not put in the spoiler and tell you why she had the luncheon for the Crawley ladies made it). But Charlotte Russe was also on the menu as a dessert at The Community Kitchen. Well, Lady Megan needs to go write and research. research and write. 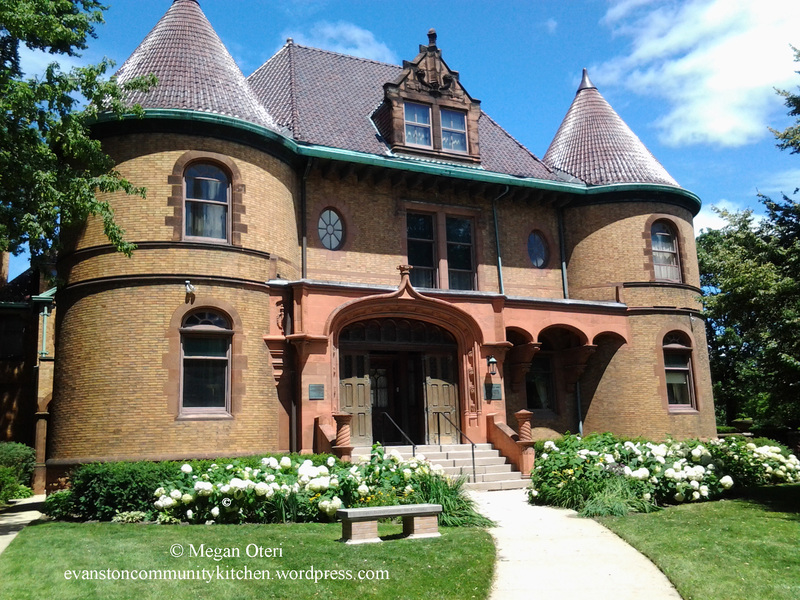 If you are new to this blog, read this (historic background of Community Kitchen) and this (my connection to the Community Kitchen) to familiarize yourself with the origins of the this historic food memoir project. 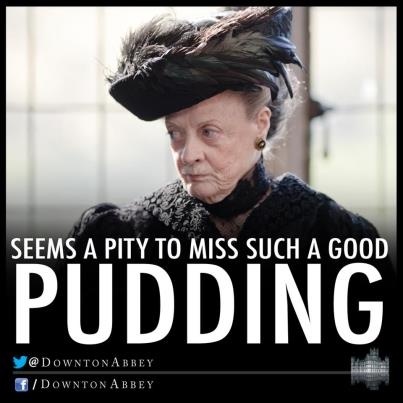 What are some of your favorite dishes on Downton Abbey or historic time period recipes? Categories: Uncategorized | Tags: archival research, archives, Charles Dawes 30th Vice-President, Charles Dawes House, Charlotte Russe, Countess Grantham, Cousin Violet, desserts, Desserts on Downton Abbey, Dowager Countess of Grantham, Downton Abbey, Downton Abbey fans, Evanston, Evanston History, Evanston History Center, food stories, foodies, history, research, Titantic | Permalink.